The National Acrobats and Martial Artists of China, an internationally renowned acrobat and martial artist group, is coming to State Theatre New Jersey and you can catch them here on November 17 and 18 for 3 performances! Since the Mid-1950’s the National Acrobats and Martial Artists have grown to become one of the best acrobatic groups in China and have collectively performed hundreds of shows with countless jaw-dropping stunts and acts. 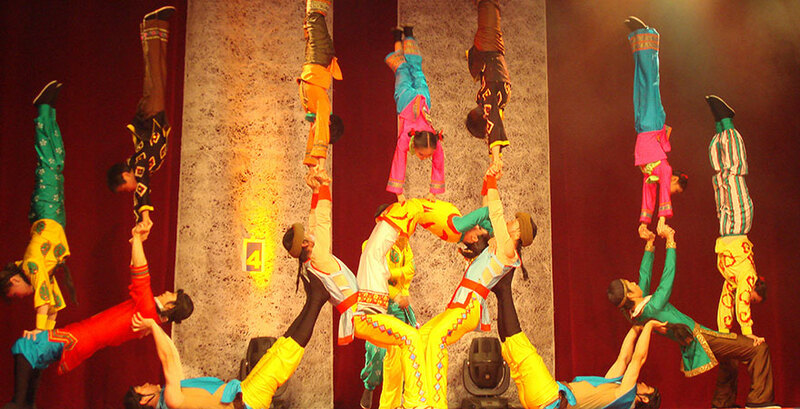 The National Acrobats and Martial Artists of China was established in 1957. It is one of the foremost acrobatic troupes in China, with an ensemble of over 100 acrobats, magicians, and martial artists. The company features over 30 acts, many of which have won prizes in national and international festivals and competitions. The group has toured extensively to France, Japan, Australia, Finland, Norway, Denmark, Germany, Sweden, Iceland, Italy, Israel, South Korea, North Korea, Belgium, Russia, Hong Kong, and the U.S. Some of the troupe’s acts have performed with Ringling and Barnum & Bailey Bros. Circus,Cirque du Soleil, Big Apple Circus, Swiss Knie Bros, National Circus, and UniverSoul Circus. There are several components to the overall show, all of which are just as impressive and awe-inspiring as the one preceding. The main acts of this performance include: Diabolo Girls, Contortion with Carpet Spinning, Martial Arts with Jar Juggling, Plate Spinning, Hand Juggling, Magic, and Straw Hat Juggling. Diabolo Girls: Similar to the yo-yo, the diabolo is a spool that is rolled, spun, and tossed from a string stretched between a pair of sticks. It has a long history in China, beginning as a game in the Imperial palace and later becoming popular throughout the country, now even turning into a national sport. Skilled performers have perfected the art of diabolo spinning, performing tricks like twirling it around the body, throwing it up or passing it to another player, or executing gymnastic maneuvers. Contortion with Carpet Spinning: Many types of Chinese acrobatics were inspired by traditional folk arts, using everyday objects in unusual ways. In this number, the acrobats twirl colorful carpets with their hands and feet. They add another layer of difficulty by twisting their bodies into unbelievable positions while keeping the carpets spinning. Martial Arts with Jar Juggling: The performers show their skill in traditional martial arts weapons and Shaolin-style boxing, while acrobats perform tumbling tricks and arrange themselves into human pyramids. This act also features jar juggling, a highly popular entertainment in China. Long ago, jars were used to hold grain, and were also used by peasants to perform various feats during harvest celebrations. The acrobats skillfully balance, spin, toss, juggle, and rotate the large jars using different parts of their bodies— including their heads. Plate Spinning: The acrobats perform plate spinning in combination with contortion and acrobatic skill while holding several plates in each hand spinning on sticks. Hand Juggling: The acrobat juggles up to nine balls at a time with incredible tricks. He bounces and catches the balls on the floor as well as tossing them in the air. Magic: The performers astonish the audience with amazing magic tricks. Straw Hat Juggling: Using straw hats as props, the acrobats juggle them and perform dynamic combinations and stunts. They work as a perfect team, tossing and passing the hats with speed, precision, and humor. Don’t miss your chance to see National Acrobats and Martial Artists of China at State Theatre New Jersey on November 17 at 8pm and November 18 at 2pm and 8pm (the 2 pm showing will be an Autism-Friendly Relaxed Performance). Come witness astonishing feats and impressive stunts that will leave you stunned with amazement.